George Delena shoots a .260 Remington rifle built by GA Precision. Wind on the Long-Range Side Match was a challenge, but George pulled through for 2nd place in the LRSM. interesting. Right off the bat I knew the competition was stiff. People were pulling out their rifles and some of these sticks were awesome. This was not your daddy's rimfire match. Wildcats and flat shooters Ahoy! The competition overall did not disappoint. Just take a look at the leaderboard: from second to ninth place were separated by less than ten hits in a 120 round match. I found myself having a bit of difficulty making hits the first day of the main match. Wind was making my Kestrel hum like an electric razor. One minute it was full value and 30mph the next it was 10mph with zero value but due to all the canyon updrafts you were lucky to keep your hat from blowing away at the firing position. Very challenging stuff. Day two was a bit easier for wind calls, but the targets seemed to be further away - and smaller! I saw one at 715 yds and thought it was from a different course of fire! In the end I wound up with a respectable finish for a first time and made a couple of new shooting buddies. Whether you're a static range F-class shooter, SWAT sniper or long range hunter gearing up for the season (all 3 were present), this match will be a challenge and it will make you better. 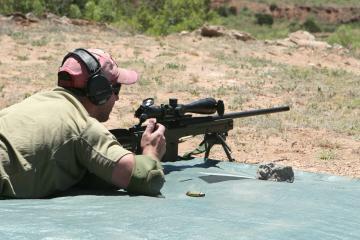 John Sternberg racks a round out of his 6.5x47 Lapua rifle during the Long-Range Side Match on Friday. This was my first trip to the Blue Steel Ranch and I hope it is the beginning of several more trips in the future. This is one awesome match. Carry 100 to 200 ounces of water and drink it all in the five to six hours you are out being humbled. Then be prepared to drink even more when you get back to the base. If you are not in good to great shape then perhaps benchrest is your sport. This is not a venue for the weak or for someone with gear that does not run. 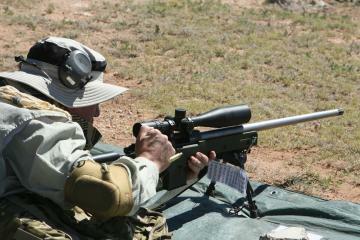 We did have some shooters go home due to the heat, wind and dust conditions and others left because of gear problems. 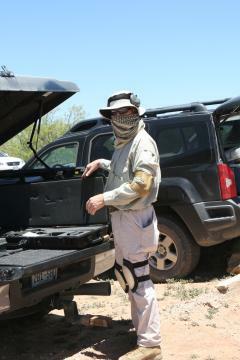 Sternberg demonstrates his strategy for staying safe in the brutal, hot sun of the New Mexico desert. then you should stay home. Your gear - make sure it works and can withstand the harsh conditions? A little dust in your chamber, bolt, magazine, nose and other open crevices and orifices will make you think twice about what you should be carrying and wearing and how much the heat matters to you and your gear. As to the competition there are always better shooters that will show you how to get your hits. The quality of the gear and experience of the better shooters makes the trip worthwhile, even if you are paying $4 for a gallon of gas (or more for diesel!). I have been shooting the Sporting Rifle Match at the Whittington Center for the past few years. This is a great training ground for the BSR but does not compare in terms of the match format or difficulty. 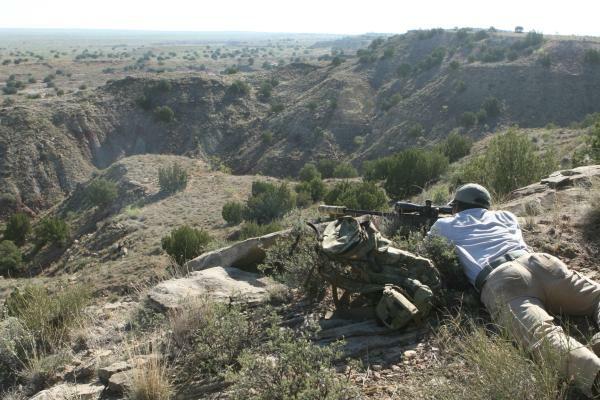 Quality optics, range finders and binoculars are a requirement to compete in either venue. I learned why most of the shooters used binoculars with a range finder --- they work better than using separate devices to first locate the hidden targets and then find them again with a range finder. At least half of my missed targets were due to failure to locate the hanging steel. The monocular range finder (I used the Swarovski) was a clear disadvantage to finding a target when compared to my Zeiss binoculars.